St. Ambrose Parish on the Hill invites everyone to the St. Joseph Altar on Sunday, March 17, 2019. There will be a Mass in Italian in St. Ambrose Church at 11:00 a.m., followed by a short procession to the School Building, just up the block. The Mass will last about one hour, so the festivities in the school will begin around 12:30 p.m. There will be two altars set up, one in the cafeteria, and one in the school. They will be blessed By Monsignor Vincent Bommarito, Pastor of St. Ambrose. Two buffet lines will be opened at that time, one in the cafeteria and one in the gym, and each will serve generous samplings of delicious food from the local restaurants. 3:30 p.m. All the money raised during the day will go to St. Ambrose School Tuition Assistance to help families facing financial hardships keep their children in the school. 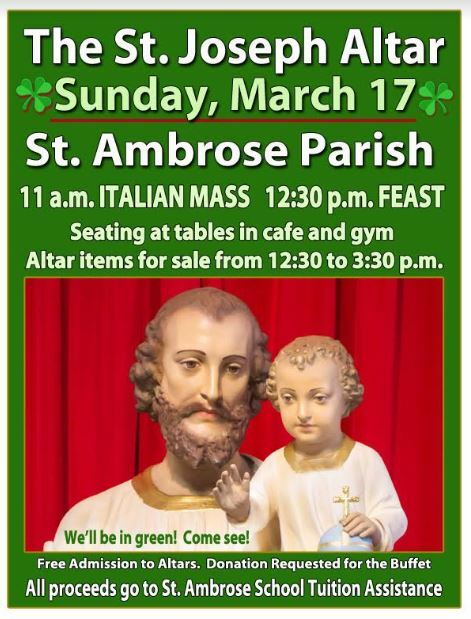 St. Ambrose Parish is located at 5130 Wilson Avenue on the Hill. Come and enjoy this wonderful Italian tradition! And this year, since the event is on St. Patrick’s Day, our color will be green. Don’t miss this celebration.